Radio interference suppression capacitors must not only satisfy EMC requirements in suppressing outgoing interference from an application but they must also protect the application from incoming power surges. Hence careful selection of these components is essential. 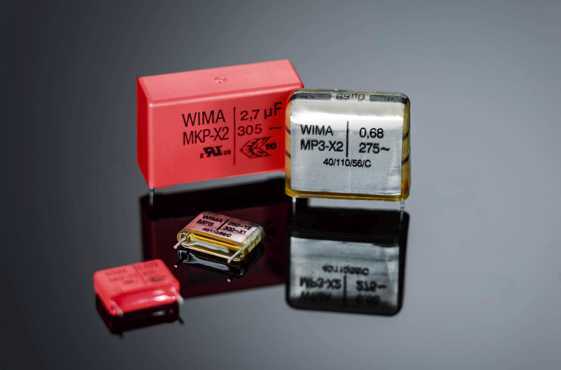 The special feature of WIMA Polypropylene RFI capacitors are the high capacitance values at smaller case sizes compared to metallized paper capacitors, being available up to 10 µF with AC voltages of 300 VAC, 305 VAC and 440 VAC for class X1, X2 and Y2 . Based on the dielectric used they are highly cost-effective. WIMA metallized paper are neither actively nor passively flammable. The components are resin impregnated under vacuum and encapsulated with self-extinguishing cast resin. Thanks to the good oxidation behaviour of the paper dielectric, they have outstanding self-healing properties even with high energy pulses. The capacitors are specified for temperatures up to 110° C and are available for class X1, X2 and Y2 applications. Class X capacitors are connected between phase and neutral or phase and phase conductors. Class Y capacitors have an increased degree of electrical and mechanical safety and are connected, for example, between phase conductors and earthed casing, and thus by-pass operating insulation. The specified rated AC voltage takes into account a rise of the mains voltage of up to 10% above the nominal value, in accordance with IEC 60384-14. The values in the tables refer to the smallest PCM of the respective capacitance value. For larger PCMs please refer to the detailed data sheets of the particular series.